Great looking family, however the old guy looks like some sort of math geek. Love your blog! Your family is adorable. You guys haven't changed a bit! Char, you're beautiful as ever -- Matt, don't see any gray in that beard, yet! I better go, my wife will get suspicious that I'm telling some woman on the internet that she's beautiful... You can check us out at my website -- but I'm not as faithful blogging as you are! It's Christmas Eve here in Perth and I'm spending a little time dropping in on the blogs I regularly read. 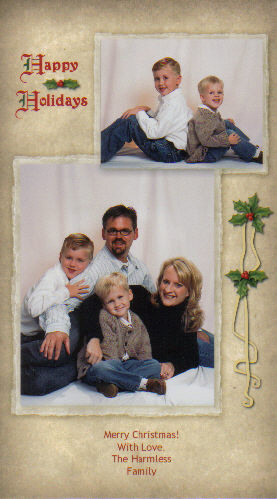 I wish you a very merry Christmas and I look forward to reading your blog in 2006.
you have a beautiful family!! Great seeing ya..even if it was just for a moment! The ICEing on the cake.